Axalta Coating Systems has inaugurated a relationship with Pardada Pardadi Education Society (PPES) to support the education of underprivileged girls in India. The funding will help PPES provide basic needs such as education material, uniforms and healthcare facilities. Recipients will be able to focus on their education and develop into women who can tap their potential and fully contribute to society. Since 2000, PPES has been improving the lives of women in rural India. Its mission is to empower women from the poorest sectors of society. To do this, PPES provides free education for girls and job opportunities for women, thereby creating a new generation of self-reliant and educated females who will be able to break the cycle of poverty in the region. 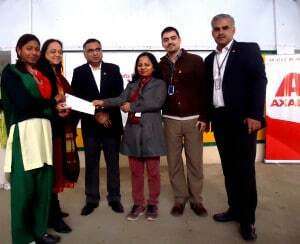 Axalta’s donation will help PPES expand its efforts in the communities surrounding Axalta’s office in the national capital region of Delhi. Axalta is committed to support education and community-based initiatives. These programs reflect the company’s commitment to sustainability. When more individuals can contribute to the economy, society will benefit, fostering an increasingly sustainable cycle of growth.